Amatrol’s Electrical Wiring Learning System (850-MT6B) allows learners to study and practice electrical wiring skills like: control wiring installation in an electrical panel; wiring installation for limit switches, solenoids, and pressure switches; and understanding the importance of correct wire size, material, and insulation. 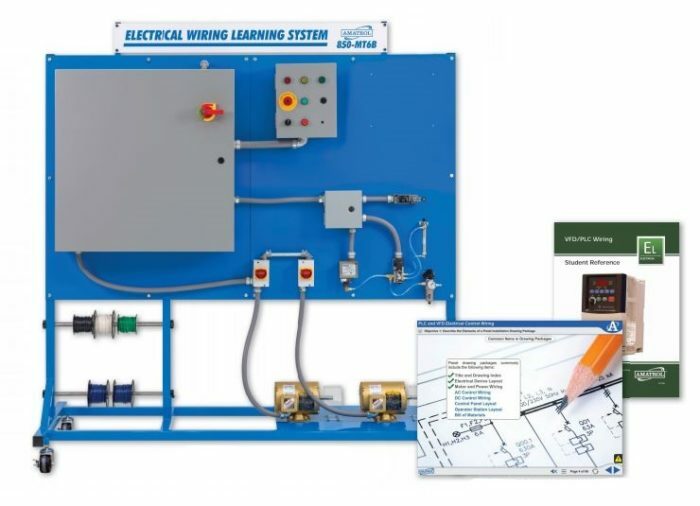 The VFD / PLC Wiring training system is an invaluable industrial wiring technician training system for careers like electricians and industrial maintenance technicians that wire control panels and operator panels on manufacturing machines. This learning system can also be used to form a strong foundation toward attaining numerous industrial maintenance technician certifications. VFD Wiring / PLC Wiring includes real-world components such as a 3-phase motor, pushbuttons, switches, valves, and a 24VDC power supply all mounted on a mobile workstation. Learners will use these components to study areas like electrical control system wiring, pneumatic control circuit wiring, conductors, disconnects, and overcurrent protection. This combination of industrial components and comprehensive curriculum will reinforce electrical wiring concepts and skills and build up a learner’s confidence and competence. VFD Wiring / PLC Wiring includes heavy-duty industrial components such as a 3-phase, 1/3 HP motor; disconnect switch; side rotary limit switch; manual shut off valve; emergency stop button; push-to-test buttons; and much more all on a mobile workstation! These industrial components can be used to practice an array of hands-on skills like installing a terminal block in an electrical panel; splice motor leads using ring lug connectors; bundle wires in an electrical panel; manually operate an electro-pneumatic valve; and select circuit protection for an application. These real-world industrial wiring components will allow learners to gain confidence and competence in working with equipment they’ll actually see on the job. VFD Wiring / PLC Wiring’s curriculum provides a comprehensive lesson on the function, operation, installation, and construction of electrical wiring and wiring components, as well as forms a strong foundation toward pursuing certifications. This course specifically covers topics such as learning the function of electrical prints, how to select a terminal block for an application, methods used to identify wires that are run between panels, methods to connect wires to terminal screws, the common line and component symbols used in pneumatic schematic diagrams, and common types of disconnects. This learning system’s curriculum is presented in a stunning interactive multimedia format that features 3D animations, graphics, text with audio voice-overs, and much more! In addition to all of the electrical wiring skills and exercises provided by VFD Wiring / PLC Wiring expansion system, Amatrol offers several other options for the Electrical Wiring training system (850-MT6B) to expand the real-work skill-building opportunities. These options include Industrial Soldering (85-MT6BB), and HMI Wiring (85-MT6BC). The Industrial Soldering training system will include soldering equipment and components commonly used in electrical connections within a control enclosure. The HMI Wiring training system teaches wiring an HMI, analog wiring, and Ethernet cabling into a control panel mounted PLC. A sample copy of the Electrical Wiring Student Reference Guide is also included with the system for your evaluation. Sourced from the system’s curriculum, the Student Reference Guide takes the entire series’ technical content contained in the learning objectives and combines them into one perfectly-bound book. Student Reference Guides supplement this course by providing a condensed, inexpensive reference tool that learners will find invaluable once they finish their training making it the perfect course takeaway.